Born in 2007 from an idea of three friends from Missoula (Montana, USA), Zombie Tools has become a successful brand in a very short time, riding the wave of the emergency Zombie Apocalypse, a myth that has exploded in America and subsequently is ramped up all over the world. The founders are Maxon McCarter, Joey Arbour and Chris Lombardi, who,with a shared passion for the blades, science and art (as well as the beer, Nordic sagas and fun in general), have managed to create an original and creative design, contradicting all those who had initially labeled it as a stupid idea. Their approach is very joyful and witty, as is clear from their official website (this could not be otherwise, because of the target), but their professionalism, creativity and originality of their products is invaluable, so much so that their products have been used on the set of horror films and television series (such as the Canadian film "City of Bones," the series "The Strain", and many others). All blades are made in a semi-customised way (relying in part to technology and in part to handmade craftsmanship) and they range from swords of various types (such as katana and Greek xiphos ), hatchets, cleavers, naginata Japanese-style; in short, all blades of considerable size to hold off the undead and behead them more easily. ZT’s products are created to be sturdy, massive, functional and above all, lasting. Their videos show how resistant their blades are and they are subjected to many kinds of cutting and destructive tests . In particular the Felon, made by Zombie Tools, which has been inspired by the lines of the famous knife conceived by Jim Bowie, is a tribute to the tradition of American cutlery. This huge full tang knife, with overall length of 50 cm, a blade 32 cm and 6.4 mm thick, is made of 5160 spring steel hardened to 54 HRc and has the typical clip point of the famous American bowie knife, with a false swedge, saber grinds and a cutting edge with a declared angle of about 19°. The blade heel was deliberately made blunt, to avoid injury when you grab the knife in advanced grip, placing your index finger in the dedicated groove. This choice was graded on the actual technical possibilities available to them and based on the instruments used; understandably the grinding creation on longer blades is never easy and it is difficult to maintain proper symmetry. The boys of ZT have therefore developed a different grinding technique and opted for a different solution from the usual belt grinder (that is used only in the final stage), using for roughing a freehand grinder with a 7-inch angle. Obviously, with a project like the one ideated by the guys at Zombie Tools, nothing is traditional and therefore their products cannot be seen with the same critical eye as with industrial blades. What is truly remarkable is the humility that they showed in admitting that they still have much to learn, and a willingness to reach a level of achievement and skills ever higher. Zombie Tools does not offer knives from a production line, but rather they are pieces in continuous evolution and in limited editions. 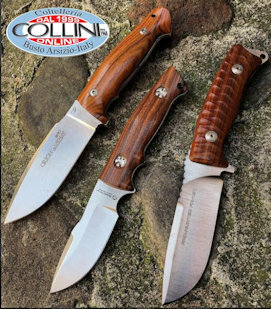 Their blades can be purchased on order (with an average waiting time of approximately 6 weeks) directly from their official website; obviously you have to choose carefully the type of blade that you want to import in accordance with your Country laws without getting too carried away by enthusiasm. Like all ZT's products, the Felon has a surface finish achieved by etching with a ferric chloride solution, which gives a lived-in effect that fits in perfectly with a post apocalyptic context. This type of treatment also has the function to confer a higher resistance to corrosion of steel, and as this is carbon steel it must always be properly lubricated to be able to preserve and retain the best condition. Also the aluminum grip brings a "rude" finish to invoke the idea of a tool made in moments where attention is paid to the substance and not to the appearance. The handle, which also possesses the guard, is made of aluminum grips with T6 treatment (solubilized, heat treated and artificially aged) attached to the tang with mild steel rivets. To improve the grip on the knife, but also from the aesthetics point of view, the handle has been wrapped with a black skin ribbon. As the ZT's guys write on their official description of the product "the handle is big enough for a gorilla’s grip", and being 17 cm in length leaves enough space even for those with oversized hands. The Felon is definitely an imposing and massive knife, especially with the remarkable weight of almost 1 kg. Initially it may seem difficult to use such an instrument easily but the balance is helped both by the size of the grip and the weight of the aluminium that goes, in part, to counter that of the blade (thing that a synthetic polymer material, for example, would not have allowed it). The sheath, made of kydex with a pressure locking system on the guard of the knife, can be carried on a belt and is equipped with slings and fastex to make it adhere to the leg. Considering the weight, the blade retention is great, but it would be unwise to carry the knife in reverse configuration (that has not sense for a blade of this type). Given the vocation of the Felon, we could not excuse ourselves from thinking about testing the blade on a zombie - keeping the goliardic spirit inspired by the ZT's guys. Clearly, since the difficulty of finding a cavy, we did opt for the adoption of a dummy representing a zombie. The tests, carried out purely for fun, have no significance from the point of view of the cutting capacity of the product; indeed the dummy does not simulate the behaviour of the human body (much less that of a zombie). Tests are, however, served to evaluate the handling of the instrument and what are its potential. The techniques used in handling and use are taken by the fighting style of Filipino Kali, executed by Fulvio Cenci, adapted to the mass of the instrument. In particular the tests have been executed in sequence: the angle 5 (stab to the body) and the angle 12 (vertical slash to the head), the angle 1 and angle 2 (swipes at the base of the neck from both sides). In general, the Felon has favorably surprised for its balance, despite the weight of the instrument, allowing tip direction changes and stabs absolutely effective, thanks to the ergonomics of the knife and a balanced choice of materials (especially of the handle). More specifically, during stab techniques the instrument gave excellent feedback, thanks to the proper curvature of the handle which has facilitated the performance and it does not give negative feedback on the wrist (which generally, with a knife of this size and weight, is the one that suffers most ). During the rotation techniques of the blade, however, the thickness of the grip did not prove to be entirely adequate since it is quite high, it does not allow a very mobile or fluid grip and the controllability is lost in part . We advise that you do not perform similar exercises or experiments with sharp instruments without adequate preparation; a blade like that of Felon, if handled improperly, can very seriously injure the user (typically to the legs). Even focusing on the target, we did not think that the mass and velocity of the instrument led it to pursue its path far beyond what one can expect. Pending the Zombies invasion, the knife was also tested on a trunk of seasoned hazel with diameter of about 20 cm. The grinds geometries clearly are not appropriate for this kind of work, but despite this the Felon was able to complete the task in about 4 minutes of hard chopping (that has inevitably scratched part of the surface finishes, as a result of the impact and friction of the blade on wood). Overall, the Felon is a great tool, more directed to the combat than anything else, and it would have been perfect in past ages, where a blade like that could make the difference between the life and death of its owner. Even from a collecting point of view it is an appreciable kind of blade, both for originality of design and purpose. Furthermore, since they are semi-custom blades with a more than affordable prices, the fans of the zombie apocalypse will not be able to resist to the temptation to possess at least one of Zombie Tools’s products.